Are grapes good for you? There’s some confusion about the nutritional value of grapes because they are high in natural sugars. However, research has shown that grapes pack a powerful nutritional punch to combat many ailments including obesity, heart disease, high blood pressure and cancer. Eating grapes is a step in the right direction when improving your nutritional regime. Have you ever tried adding healthy foods to your diet only to fall back into bad habits? Adding grapes to your eating plan is delightfully easy. Not only are grapes readily obtained, they are delicious. Energy density is defined as the amount of calories found in a fixed quantity of food. When you are trying to lose weight, you should be looking for low energy density foods. In this way, you can fill your stomach with fewer calories. It is true that grapes have natural sugars, but this fruit is still a good choice for people who are trying to lose or maintain their weight because grapes have only 83 calories for an entire cup and are packed with dietary fiber. Antioxidants provide powerful health benefits while protecting your cells from damage caused by free radicals. All grapes offer antioxidants but red, purple and black grapes have plenty of resveratrol and flavonoids; known for their curative properties. Resveratrol was described at length on 60 Minutes. Scientific studies have not determined exactly which components or combination of substances in grapes provide health benefits, but research points to the following advantages from grape consumption: promotion of heart health, control of blood pressure and prevention of cancer. Grapes are a good tool for those of us who are aiming to improve our heart health. Analyses have shown that resveratrol helps lower bad cholesterol (low density lipoprotein or LDL) as well as reducing the risk of cardiovascular disease and blood clots. Medical News Today states that flavonoids naturally provide anti-inflammatory properties that also help to lower LDL damage in animal studies. Even though this research has not progressed to human testing, the preliminary results are promising. The article also discusses the fact that the large amount of polyphenol in grapes prevents cardiovascular disease. Further, the potassium in grapes benefits heart health by lowering the risk of heart disease and stroke. Are grapes good for you and your blood pressure? According to the University of Michigan, the answer is yes. WebMD discusses University of Michigan findings showing that grapes reduce hypertension in laboratory rats fed powdered red, green and black fruit. The control of blood pressure results in improved heart function. The investigation results suggest that flavonoids are the possible source for preventing hypertension; but further studies are necessary to narrow down the exact mechanism. Meanwhile, we have solid and important information that we can use in our daily lives because we know that grapes contain a powerful substance that can help us keep our blood pressure in check. Resveratrol not only acts as an antioxidant, but also as an anti-inflammatory agent. Animal studies have shown that resveratrol prevents health issues that have been proven to cause cancer. 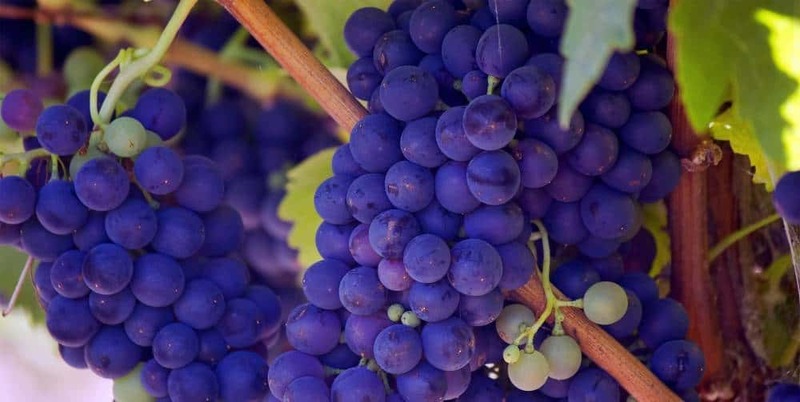 Laboratory studies indicate that the use of resveratrol can actually slow the development of cancer cells and inhibit tumor formation in human cells. 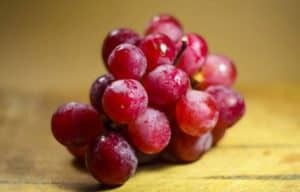 Other studies show that resveratrol causes the destruction of cancerous tumors. If you are interested in the details of cancer research regarding the use of grapes, check out the AICR website. 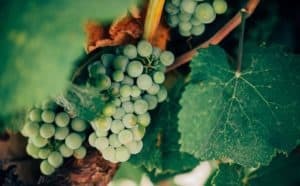 What are Some Good Alternatives to Fresh Grapes? Sometimes it can be hard to find good grapes, especially in northern regions in the middle of winter. Even when they are in season, it can be difficult to keep fresh grapes on hand every day. If you’re eating grapes for their low energy density, raisins are not a good choice for you since one cup has approximately 495 calories. 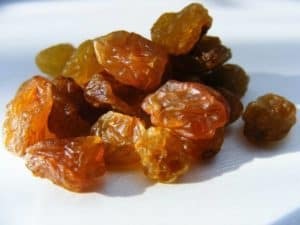 Raisins have plenty of antioxidants that are concentrated during the drying process. However, the amount of resveratrol has been shown to be lower in some tests. This could be due to the fact that resveratrol is destroyed during the drying process or because the dried grapes are green. In order to get the most from raisins, consider buying dark raisins or a blend of raisins. Grape juice is another poor choice concerning energy density. Unsweetened juice has only 62 calories per cup but all of the satiating fiber has been removed. On the positive side, grape juice retains beneficial flavonoids and antioxidants, including resveratrol. Be careful to avoid juice that is labeled as grape juice but contains mostly apple juice. Also, some grape juices are laden with unhealthy sugar. Look for pure grape juice and read the label carefully. 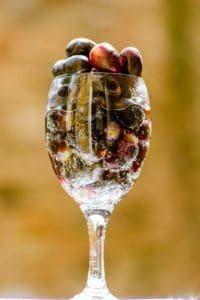 Frozen grapes contain only small amounts of resveratrol but retain other healthy substances and antioxidants. Frozen grapes taste even sweeter than fresh grapes. This treat is a great substitute for ice cream or popsicles with approximately 100 calories per cup. This lovely little fruit can keep your heart ticking strong, lower your blood pressure, protect you from cancer and more. Are grapes good for you? 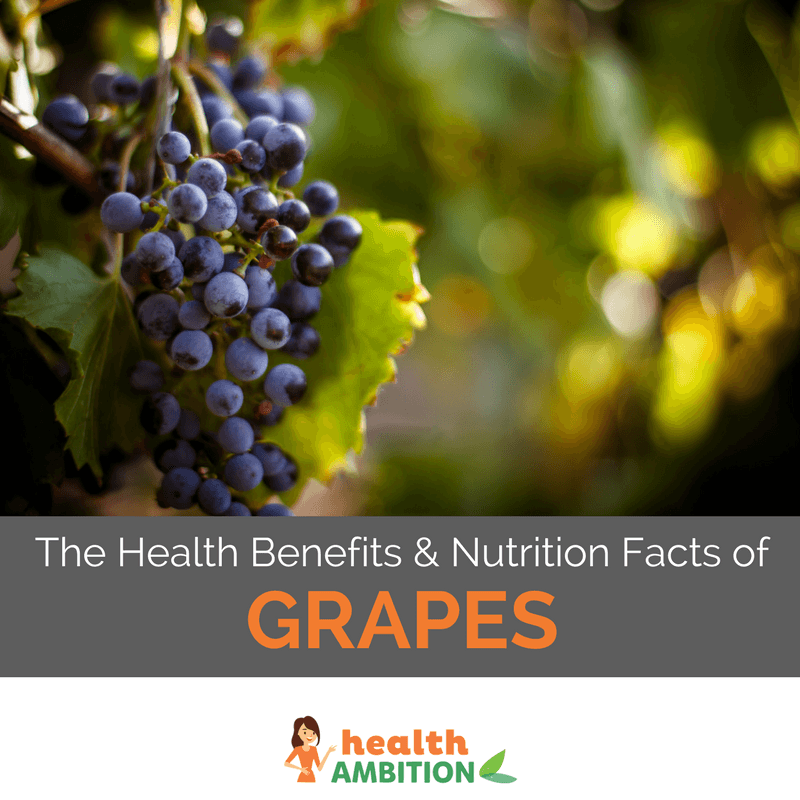 The list of health benefits is likely to grow as scientists continue their research to find out more about grapes. Meanwhile, you can simply enjoy their lusciousness every day in the form of fresh grapes, dark raisins, a blend of raisins, pure grape juice , or frozen grapes. Let me know what you think! Do you have any ideas or recipes to share?